In 2008, Logitech acquired Ultimate Ears (UE), a company that specialised in custom in-ear monitors for on-stage musicians. Since that time, Logitech has helped UE transform into one of the most beloved brands for portable consumer audio. A large part of the brand’s success can be attributed to the quirky design of the speakers, like the cylindrical Boom or the flat disc shaped Roll, as well as offering unique outdoor features, like being water and dust proof. 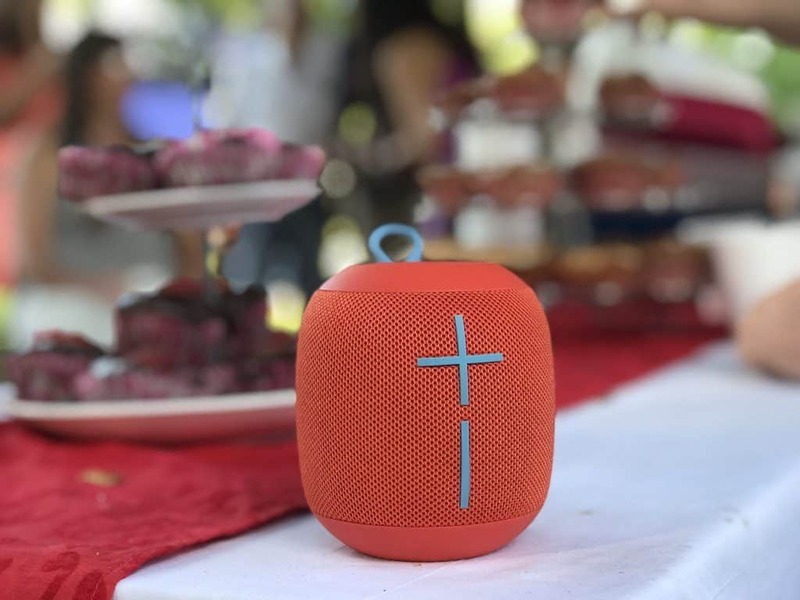 With this in mind, Logitech has officially launched its most durable and compact unit yet, the Wonderboom. 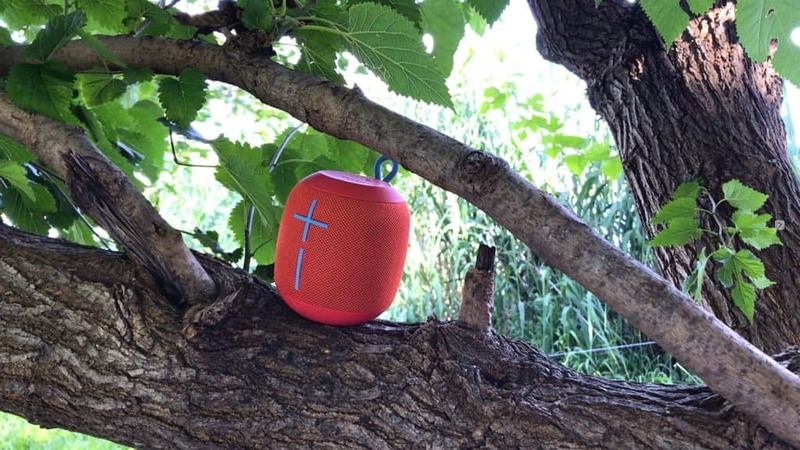 The UE Wonderboom is a small softball sized little speaker. 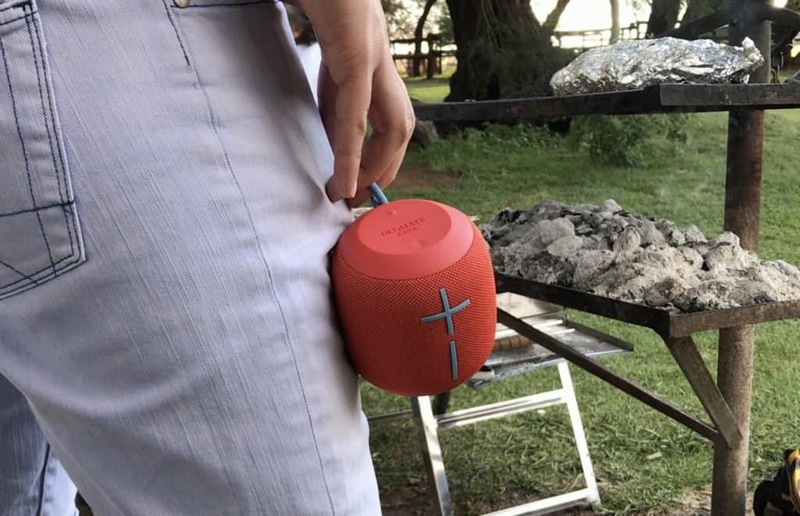 Think of it as a shorter and fatter UE Boom, which must have been the initial design inspiration for this new speaker. Although small, at just over 10 cm tall and just under 9.5 cm in width, it has a really good weight to it, which gives it a nice premium feel. Other than resembling a short and fat soda can, the little speaker is comprised of mostly material and rubber parts. The top and bottom of the speaker are made from a durable rubber, which not only gives the little speaker some great grip when held, but it also absorbs any shocks from accidental falls – like when you ‘pass’ it to someone and they do not catch it. In total, the device has five buttons. The two buttons on the trunk of the device are the signature ‘+’ and ‘-‘ symbols, which are used for adjusting the device’s volume. They are slightly raised, making it quite easy to find and press the buttons without actually looking at the device. They can also be pressed at the same time for an indication of battery life. The other three buttons are on the rubberised top of the device. 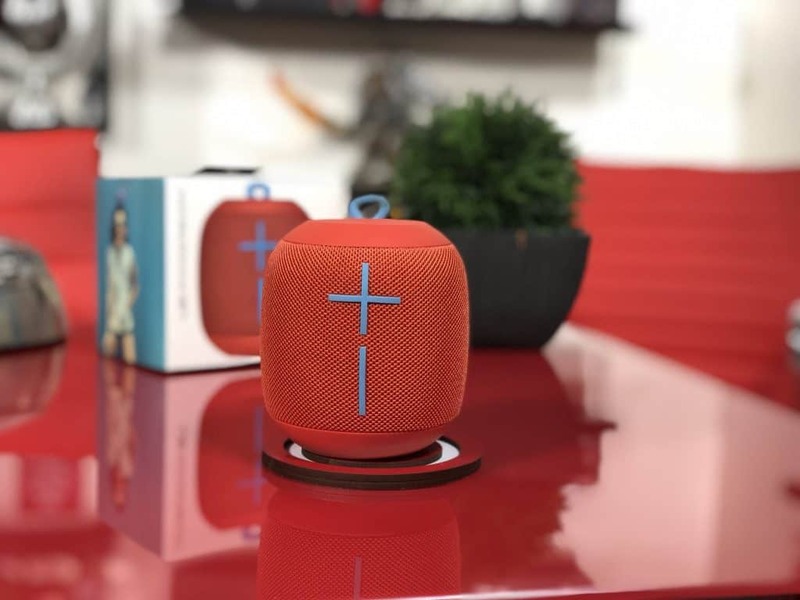 There is one for power, one for bluetooth connectivity and a third (hidden under the Logitech Wonderboom logo) that has multiple functions (play/pause, skip track, or syncing multiple devices together). Each time one of the buttons is used, the speaker will give audible feedback via a series of pulsing sounds to indicate what it is doing. Buttons aside, the top of the unit also has an elastic loop. At first, the elastic loop seemed like a bit of an odd addition. However, its use became evident quite quickly. Although I think its primary purpose is to be used with carabiners on backpacks or swimsuits, I found that it allowed the speaker to be hung on pretty much any available protrusion. During my time with the device, I found the little elastic loop to be quite convenient, especially when my hands were full. 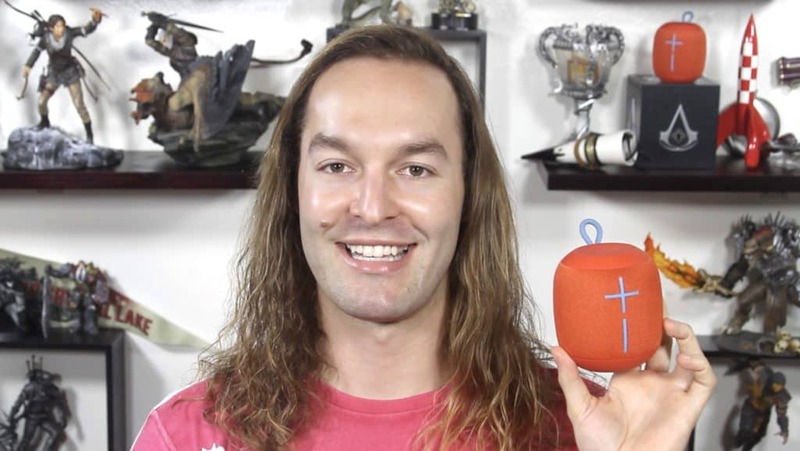 In addition to being able to hold the device with a single finger, it also allowed me to hang the UE Wonderboom from a variety of places; like a belt, on a rucksack, from a tree, and even on door handles. This effectively gives the device an entire new range of locations for placement, making it perfect for when space is an issue. The bottom of the device is also made of rubber and has a single flap that hides a Micro-USB port, which is used for charging. Although some might lament the fact that it is not a USB-C port, I think that going with the more popular Micro-USB makes sense, at least at this moment in time. Apart from the rubberised top and bottom, the main trunk of the UE Wonderboom is covered in a wonderful mesh-like fabric. It has a similar feel and texture to the fabric used on the Logitech G433 gaming headset. This time, however, the fabric is both dust and water resistant (water just glides off of it). Naturally, this goes hand-in-hand with the speaker’s IPX7 rating, which means that it can be fully submerged for 30 minutes in one metre of water. Even better, the speaker floats, which means that you do not need to worry if it falls into a body of water, since it will just float on the top until retrieved. 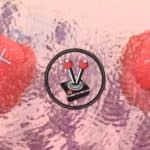 Vamers was lucky enough to receive two units for review, both of which were a gorgeous ‘Vamers Red’. 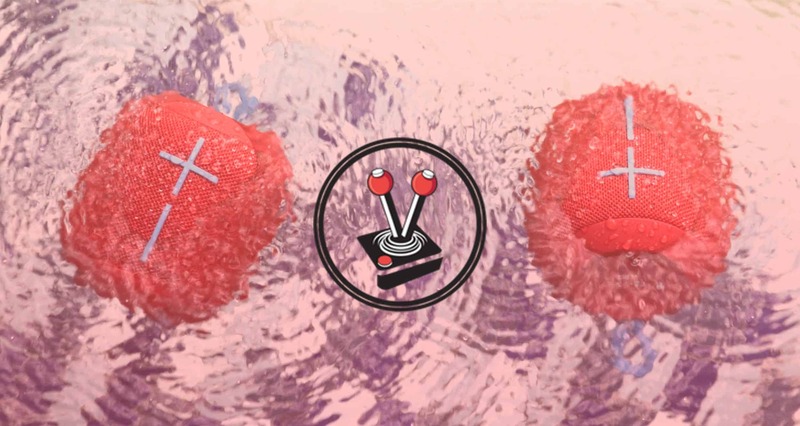 With that said, the UE Wonderboom is available in six different colours, namely: Fireball (red), Lilac (purple), Phantom (black), Stone Grey (grey), Subzero (blue) and Cashmere (pink). I personally feel that the ‘Vamers Red’, Phantom and Subzero colours are the nicest. Although the colour option is a personal preference, it is great that Logitech offers so many different colour combinations. I personally really like the design of the UE Wonderboom. It is small, solid and unassuming… until you begin to play music on it. When it comes to portable speakers there are two very important factors that can make or break a product: battery life and sound performance. Thankfully, it was a pleasure to find that the UE Wonderboom excels, for the most part, in these categories. The audio on this device is superb, especially considering its size. Over the course of three weeks, I used the device in a variety of scenarios. 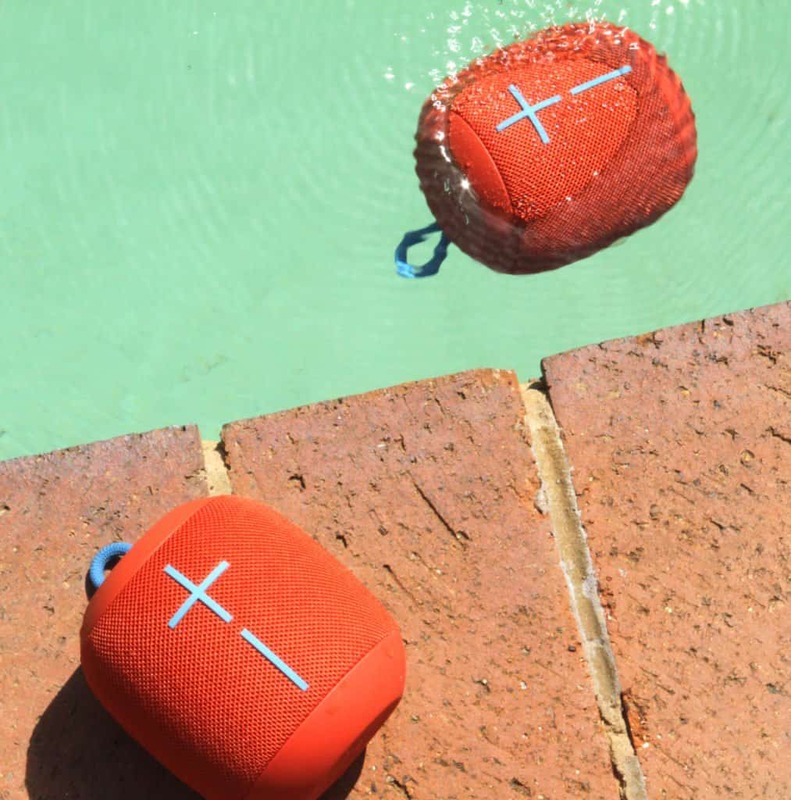 Whether at a family birthday braai (BBQ for international readers), on safari, in the pool, in my car, or simply sitting on my desk; the UE Wonderboom more than provided enough volume and ‘oomph’ to keep myself, and the people around me, happily listening to music. The device is able to output some extremely decent lows, with bass reproduction being one of its strongest aspects. Granted, it is not going to provide the kind of bass one would expect from speakers like the Bowers & Wilkins Zeppelin or a Bose SoundLink Revolve, but since it is less than a quarter of the size of the aforementioned units, it is not expected to. Rather, it does fair comparatively well against the performance of the Bose SoundLink Mini II; and it absolutely thrashes the UE Roll. The UE Wonderboom also does a good job of producing decent mid and high notes. As long as this one caveat is met: the volume must be lower than eighty percent of the maximum. One of the most impressive aspects of the UE Wonderboom is how loud the device can get. A single speaker can easily fill a four by six meter room with ample audio. Two or more, and that size can quickly grow to ten meters squared. There is no doubt that the device is not shy when it comes to how loud it can perform. Unfortunately, this is also where this little unit’s biggest caveat lies. Although bass reproduction is extremely decent given the size of the unit, issues with mids and highs surface once the device’s volume exceeds 80%. After this threshold, audio distortion becomes quite clear. However, this is only a small limitation, since even at eighty percent volume, the UE Wonderboom is incredibly loud, especially indoors. Another great feature of the device is the way in which Logitech utilises the design of the unit to influence the way it produces audio. As such, the little speaker features “360 degree” audio; and this is not just a marketing term. No matter how the device is positioned, it genuinely feels like it is producing audio in a perfect 360 degree sphere. It is able to do this because it has two 40 mm drivers and two 46 mm by 65 mm passive radiators, with two of each covering a 180 degree audio scape. The result is nothing short of impressive and means that no matter where the UE Wonderboom is placed, it always sounds great. With that said, it is not the kind of speaker I would use as my daily driver. Although the audio it produces is quite decent, it really does lose a lot of definition the louder it gets. As such, it is really more of a secondary speaker. The kind of device you pick up, throw into a bag and head out to the park or the beach. It is light, fun and meant to be the background of a party, rather than the centre of it. That is, until the battery runs dry. Battery performance on the UE Wonderboom is great, as long as you do not run the device at full volume for longer than two hours. Given the aforementioned limitation regarding distortion, it would make sense not to. Nevertheless, there are usage case scenarios where this might be needed. If this is the case, then the unit will only last around two to three hours. Bear in mind, this is at 100 percent volume. In a more realistic setting, however, where the volume ranges between fifty and eighty percent, then the UE Wonderboom begins to excel. During this kind of a usage scenario, the little speaker will last for between six and ten hours (again, the total time is dependant on volume). The speaker also allows you to check how much charge the battery has. This is done by simply pressing the volume up and down buttons at the same time. Doing so will cause the speaker to emit an audible ‘boop’. There are three different sounds to indicate if a battery is: well charged, about halfway charged, and nearing the end of the line. Since there is no other way to check the battery level, not even in an app, it would have been better if the speaker audibly spoke the battery percentage, like the Bose SoundLink Mini II. With that said, performance is generally good enough that worrying about the battery should not be a concern. In one sitting, at between forty and fifty percent volume, I managed to crank out just over ten hours of overall performance before the little speaker required a power outlet. Given the three hour charge time, I do think the performance is more than adequate. The great battery life is no doubt in part to the unit’s use of Bluetooth for connectivity. The UE Wonderboom is a wireless device, except when it needs to charge. Therefore, much like what Apple and Google have done with their smartphones, it does not have an auxiliary port. The only way to connect to it is via Bluetooth. Using Blueooth, the speaker can pair with up to eight different Bluetooth enabled devices. Whether that is a smartphone, tablet, Mac or PC; as long as it has bluetooth it can output audio to the UE Wonderboom. It can also accept two concurrent Bluetooth connections; so you can have your iPhone and iPad connected at one time. Connecting is simple. Once the device is turned on, it will automatically emit a Bluetooth signal. Thereafter, you just need to go into your Bluetooth settings and select ‘WONDERBOOM’. 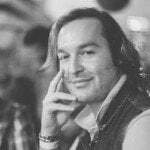 The connection will happen automatically. It it does not, for some reason, simply long pressing the top most button on the head of the unit will put it into pairing mode. I must say that the Bluetooth connection on the device is excellent, and works well within the thirty three metres that Logitech has specified for the device. I dare say that it works at an even further range than advertised. Just as long as you only use one speaker. One of the more unique aspects of the UE Wonderboom is one that it inherited from its bigger brothers: the ability to pair multiple speakers together. A maximum of two speakers can be linked together by long pressing the UE Wonderboom logo on the top of the devices. Doing so pairs them, and the sound can be played from one audio source. In practice, this is a simple process and it worked fairly well. However, it is not perfect. In my experience with the devices, I found that linking two speakers together severely weakened the Bluetooth connectivity radius. With only one speaker connected to my iPhone, for example, I could easily walk close to 50 meters away before the speaker would lose connection. With two paired together, however, moving only a few meters away would cause the speakers to crack and pop with signal loss. I also noticed that there were a few times whereby the speakers would lose sync with each other, resulting in a similar loss in signal and thus distorted and crackling audio – this happened within meters of the speakers. However, when it did work, it worked extremely well. One UE Wonderboom is already quite a perky little speaker with great audio, but two together takes it to a whole new level of performance. One that can easily rival some of the bigger names in the portable audio industry. The UE Wonderboom is easily one of the best portable speakers I have had the pleasure of testing. It packs some seriously impressive ‘oomph’ in a package that is not only small and portable, but also water and dust proof. The device has obviously been crafted to be a quick pick up and go unit. One that provides decent enough audio for a fun trip to the beach, an impromptu house/pool party or even a quiet picnic. As such, I do not think it is meant for audiophiles or to replace the speakers you would use on a daily basis to listen to your favourite music tracks. Rather, it is more of an “in the moment” device where it will serve as decent background entertainment. When compared directly to the Bose SoundLink Mini II, the UE Wonderboom does have less definition in mids and highs, with slightly weaker bass and no mic to take calls. However, given that it has a suggested retail price (ZAR R1499/US $79.99 /UK £89.99) that is less than half of the excellent Bose unit. To be honest, I would rather purchase two UE Wonderbooms for the same price, and then enjoy them at the beach or wherever, because I know they will survive the outing. The UE Wonderboom is a great little device that is perfect for those moments when you need music. It will get the job done, and it will do so in the dust, whilst being thrown around, perhaps hanging in a tree, and definitely when you are in the pool. Acquisition Review device courtesy of Logitech. 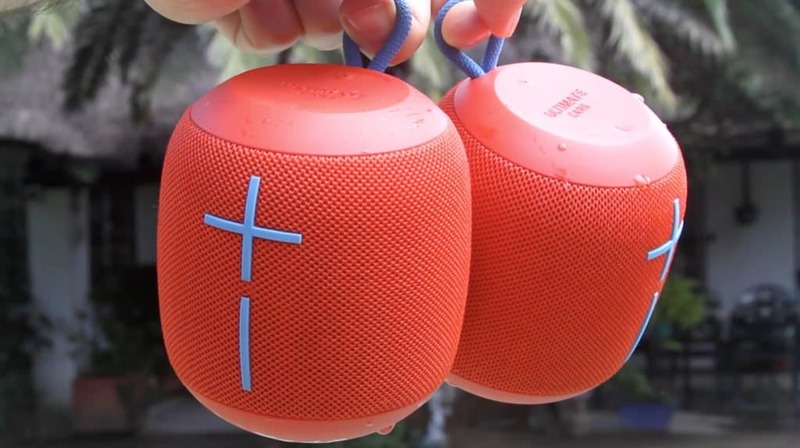 The UE Wonderboom is easily one of the best portable speakers we have had the pleasure of testing. It packs some seriously impressive 'oomph' in a package that is not only small and portable, but also water and dust proof. Next articleAwesome Ster Kinekor Entertainment Festive Deals are not to be missed!